whether you want curtains to become a focus in the living room`s interior or harmonizes with the selected color and stylistic design concept. The modern style of the rooms is committed to simplicity and brevity. Even to a certain minimalism. Herewith design should not lose in terms of convenience and comfort. The decorating of the room plays an important role. And the creation of a warm and friendly atmosphere in the space of the living room is directly related to the used textiles and method of its presentation. Classic curtains, flowing down by straight, light folds is a failsafe option for draping of modern facilities. At the same time curtains and blinds can not be used at all, giving the room an opportunity to bask in the sunlight when it does not disturb the house owners or their guests. Original visual effect can be achieved by using the most traditional curtains for narrow windows, just hung on each side of both windows. Thus, natural light in the room would be sufficient. And the symmetry will be maintained, especially if the windows are located on the both sides of the fireplace acting as focal center of the room. Curtains with lambrequins are suitable for rooms with high ceilings and large windows. In the living room of modest size pelmets will look out of place, reducing the height of the room visually. In a modern style, even such textile design as the curtains with lambrequins become simple and concise – fringe and tassels are no longer used, additional windows` decor is not needed. In addition to the original design of window openings, designer can hide some flaws in the design of windows or flaws in the finishing of the walls by using of the lambrequins. Roller blinds of plain natural fabrics (cotton or linen) perfectly harmonize with the simple, uncluttered modern environment of the living. For a room decorated with the apparent share of minimalist is not easy to choose the decor for windows, but the blinds and shutters manage brilliantly not only with their primary function, but also serve as decoration. Thin roll printed canvas makes sense to use in conjunction with monochrome black-out curtains. This window decor will harmoniously complement calm, not flashy in terms of colors, the living room in the colors of natural origin. Roman blinds, which represents a continuous cloth permeated with horizontal bars, at a certain distance from each other, can be used both as an independent decoration for windows, as well as the complete set with traditional curtains. Fabric blinds do not lose their popularity. But for living space it is better to give preference to vertical modifications of this type of draperies for the windows. They not only protect the room from the bright sun, but also create the visual illusion of increasing the height of the ceiling due to vertical stripes. Vertical blinds for residential area are more preferable than horizontal ones that can evoke association with office space and eliminate all the efforts to create a homelike atmosphere. If nevertheless the interior of the living room uses horizontal blinds, then, as a rule, they are presented in bright colors. A faint sun protection is always complemented by curtains of dense tissue. This can be as the solid material so as fabric with pattern. For the living room, which windows are protected by shutters, you can use a modern version of the cornice – curtains on the eyelets strung on two small pieces of round cornice with delimiters. In this case, nice and thick curtains are used as decoration and venetian blinds are responsible for the practical side of the issue. Featured in our country curtains on eyelets are plastic or metal rings, which are strung curtains at the cornice, continued marching over modern living design projects. Such curtains are original by themselves, because most often found in plain colors without decoration. Eyelets can carry not only the black-out curtains, and light curtains too (you just need to make a small thickening of the upper edge of the fabric by non-woven backing or some other thick material). Echoes of the use of French curtains in the classical interiors transformed into a simple and concise solutions space, decorated in the style of neoclassicism. Fine, but do not crying about luxury curtains will become an elegant design decoration of the living room. In terms of cornices` design, there are several design options in modern living room. One of them is a hidden cornice, which is located behind the moldings adorning the ceiling. In such premises the curtains hung under the ceiling and contribute to increasing the visual height of the room. Various decorative accessories for curtains, including clamps, are still not in the past and used in the modern interiors, especially if the design involves the use of romantic or eclectic style in a family room. Classic dark curtain of dense material will be relevant in the living room, arranged in almost any stylistic direction. Contemporary style options, modern and neoclassical would be harmoniously underlined by traditional curtains in a dark color, especially if such a tone is already presented in upholstery, lampshades lighting design, by cushions or other decorative elements. 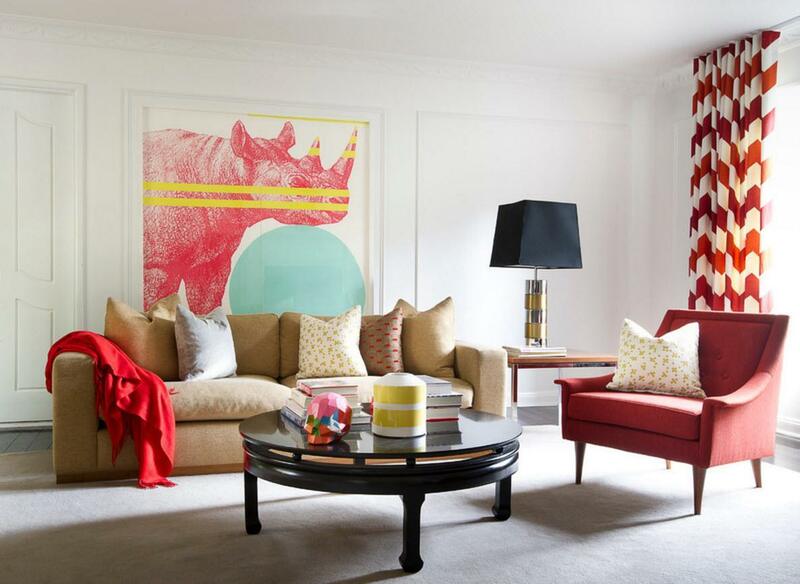 When you are decorating any room, including the living room, there is an unwritten rule known to all – if the wallpaper in the room are have the painting, the curtains have to be plain and vice versa. But there are exceptions in every rule, and there is mass of examples of successful use of prints for decoration and textile design for window openings, not to mention the performance of striped surfaces and fabrics. Bright, pastel curtain is a win-win option for a relaxing and comfortable interior of modern living room. Large windows, decorated with the help of light tulle or translucent cotton curtains maybe won`t become the center of attraction views, but will serve as the perfect backdrop for bright interior – furniture, lighting and decorative elements. Bright translucent curtains will be a great addition to an interior room with a dark finish of the walls. 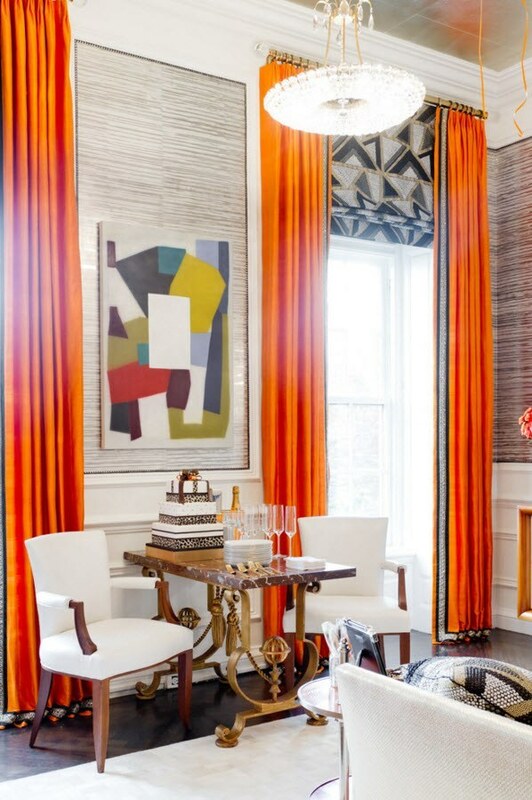 The contrasting colors give the room the texture and dynamism. The original appearance of the curtains can be achieved if combined not only different colors, but the materials themselves. Darker and denser material of the curtains can act as an accent color and a weighting agent for straightening the fabric. 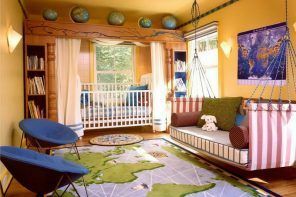 A similar combination of colors (more than a dark bottom and light top) helps visually increase the height of the room. Living in beige tones is always relevant. Calm natural tones, tranquil and relaxing atmosphere – to maintain this image we need the corresponding curtains of milk chocolate, cocoa or dark sand color. 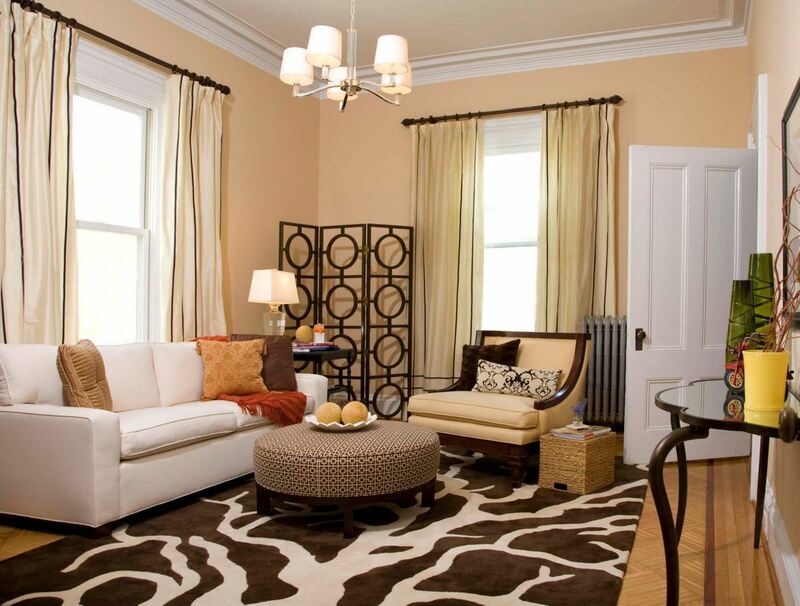 Bright curtains in the living room as an accent is a modern, stylish and practical step. If the colorful shade of the drape of your windows become boring after a while, you can change the way of living only by sacrificing textiles. In order to fit bright curtains harmoniously into the interior of the living room, it is better if the focus will only at this element of the design space, and more calm, muted shades of bright colors would be found in the upholstery of furniture or decorative items. Printed curtains is an infrequent variant of window decorations in modern living room. If you use pattern on the fabric, better it should be the soft, often geometric or floral. If you want to visually expand the space of the room, so use blinds with horizontal stripes. If you need to achieve visual increasing the height of the room – hang the fabric with vertical stripes at the window. Traditional for living rooms version of the combination of colors and prints of the textiles is the use of a single material for the execution of window draperies and slipcovers for cushions. To avoid unnecessary medley in the formation of the living room`s image, you can use plain materials for window openings, as well as for textile design of the soft recreation area. Contrasting striped curtains will be a great addition to the interior of the living room in the Art Deco style, especially if the window frames are finished in black. Black-and-white theme can be duplicated in the cushions` textile or wall decor. Motley print of the curtains decorated in bright colors will be a great decoration of windows in the living room with a snow-white finish. To create a harmonious design, duplication of colorful flowers in the colors of curtains and other decorative items, such as upholstered furniture and wall decor will not be superfluous or excessive. Using the curtains of only two shades of the same color allows you to create an original, but not frilly window decoration with textiles. Especially harmonious such windows drapery will look in the living room with carpet or upholstery in the same color scheme. 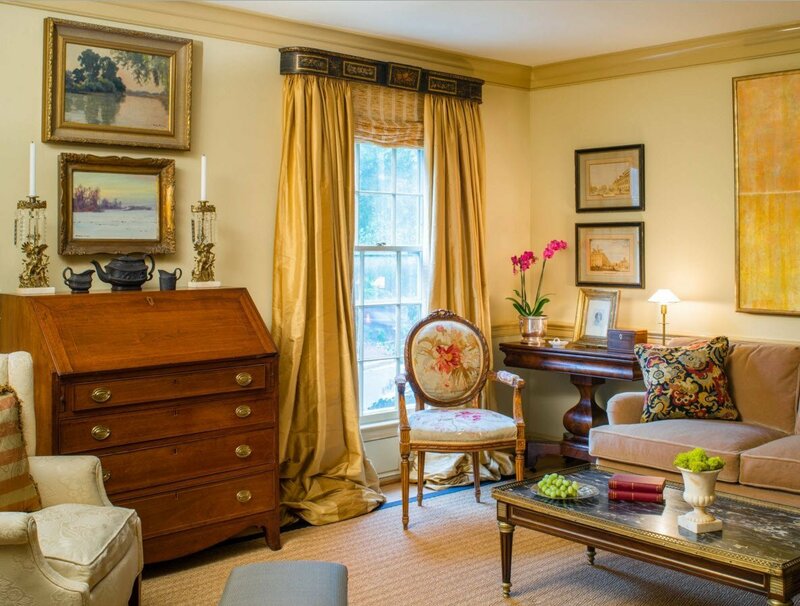 As an accent color can act even neither curtains but their cornice. For example, the dark ledge can perfectly blend in with elements of lighting, furniture frames or decorative elements of the same color. The snow-white tulle will always be in fashion. This variant of the windows design in the living room can be used in any stylistic of the space decoration. Light curtains look particularly impressive against the contrasting walls` background. If you are not interested in using of a perfectly smooth and symmetrical folds, try adding a little looseness in the interior – let the curtains flutter arbitrarily. 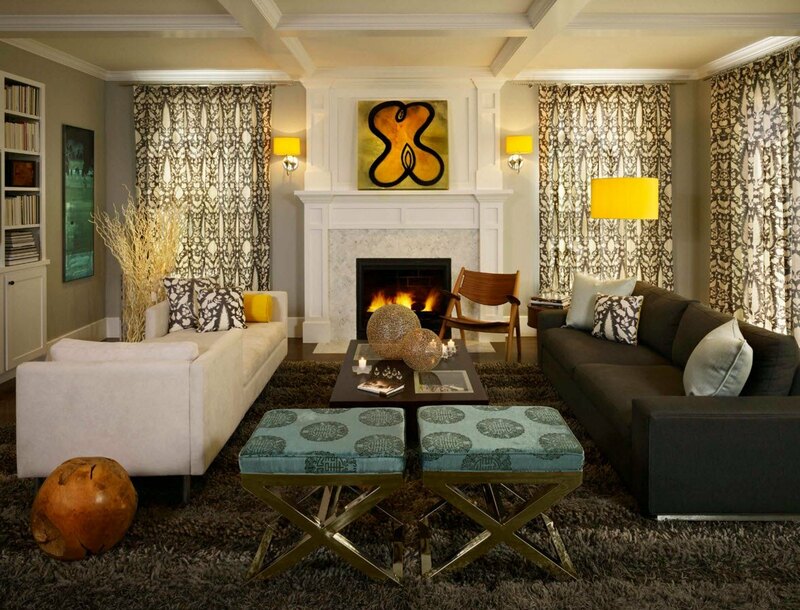 The black (or dark gray) curtains in the living room is bold and modern solution. Of course, so dark shade of curtains will look naturally without weighing the interior only in the room with a very bright, white walls and ceiling finish. Often living room appeared as combined with kitchen and dining room space. The open layout of such spaces can be found in private homes and apartments. In suburban households alike premises are equipped with a couple different designs of the window openings – it may be windows of a different size, and large glass doors needing of textile design. The modern design projects can be found not only the use of different design curtains for the window decoration, different in shape and size, but different types of the material for the textile draperies of windows and doorways. If your living room has a bay window, so the problem of large windows draping becomes very acute. In some modern design projects panoramic windows or window frames in standard sizes in the oriel are recommended to not decorate with textiles at all. But for the spaces located on the south side this option is not always practical. You can use a semi-transparent tulle of light colors, which on the one hand does not significantly affect the formation of the color palette of the space, but on the other hand will properly fulfill its function. For a semi-circular bay window curtain can be used a cornice with an arc basis. Such models are hard to find in a broad sell, usually such a purchase requires a pre-order, but it worth your spent effort and money. The curtains smoothly “slide” on such eaves along the bay windows and can provide protection from the sun for the hosts and their guests. Large French windows with arched top, are looking as the regal luxury. Such externally attractive designs allowing room to literally bask in plenty of sunlight, should be arranged adequately. Many folds of taffeta curtains would be an elegant crowning of not only windows, but also the living room interior image as a whole. The living room with large windows located on the floor to the ceiling, you can use the intermediate fabric curtains. This method allows the window to be decorated from three sides (double sheet often located in the middle) and, if necessary, the entire area of ​​the panoramic windows will be closed from the sun or prying eyes.